If eggplant salad isn’t a go-to dish in your house, it’s time to change that! 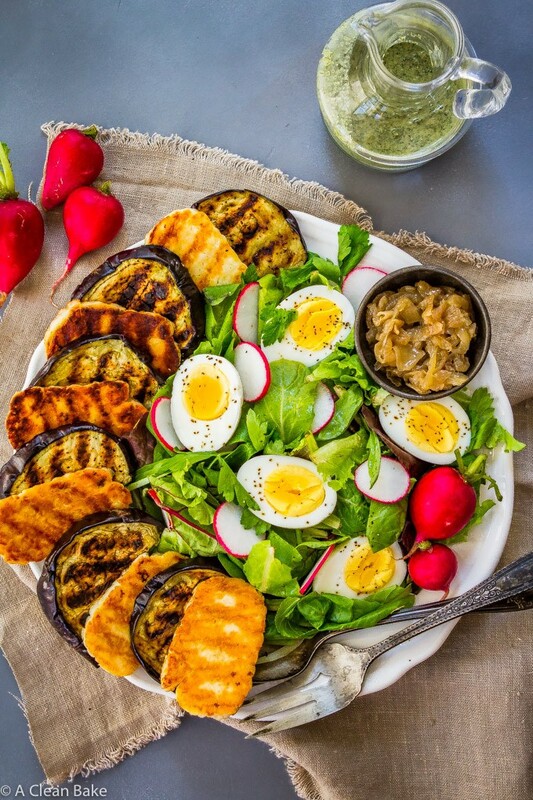 Throw some sliced eggplant and halloumi cheese on the grill, or in a pan, and add it to a bed of fresh greens, crisp radishes and hearty hard boiled eggs for a meatless entree you’ll love. 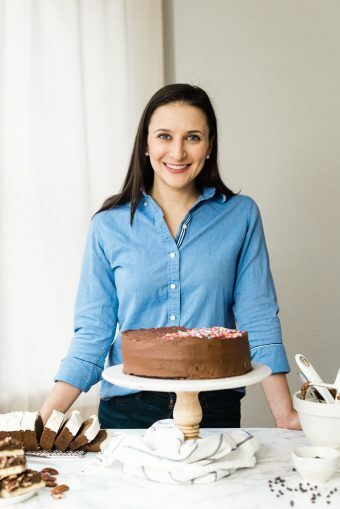 Don’t you just love recipes that, despite no planning and totally flying by the seat of your pants (or the content of your fridge), turn out to be something you’ll make again and again? The other day, I had an epiphany: It was one billion degrees, we had 3/4 of an eggplant in the fridge, plus a brick of halloumi that my mom brought over because the store closest to her has it for several dollars cheaper than the store I shop at, and I really needed some vegetables. That Chicago was, for the first few days of this week, so hot that we had to pull out an auxiliary window air conditioning unit for Baby Bake’s room because the central air wasn’t doing enough, meant NO WAY was I turning on the oven to make the dinner I’d (loosely) planned. In an effort to keep the heat to a minimum – because Chicago was already one of the hottest cities on the planet, literally, so I had nothing to prove – I decided to grill. Each time I go to the grocery store, I pick out one type of produce that Baby Bake hasn’t tried yet. Last week it was eggplant. This week, turnips. Since we’d already moved on from the eggplant (too much water, too many seeds), I thought I’d slice it up, throw it on the grill (or in a grill pan) and … what? Halloumi! Every time I’m out in the ‘burbs, I like to go to Pete’s Market, an awesome grocery store that stocks pretty much everything you could possibly think to put on your list. I guarantee that if you are desperately in need of a plantain-limburger-chicken sausage-homemade saurkraut smoothie, they will have you covered. Also, why? But back to the salad. The prices are pretty good on things that are, well, not well priced at any of the yuppie grocery stores near my house. A small block of halloumi at Mariano’s is $11 (noooope.) so my mom grabbed some for me in the ‘burbs. Kinda like cheese arbitrage, if you will. But you don’t have to. So, I threw that on the grill too, because it never ceases to entertain me to watch cheese not melt over direct heat. It’s the same reason I like the concept of fried ice cream or baked Alaska. You know what I mean, right? As for the salad part: I wanted a salad? 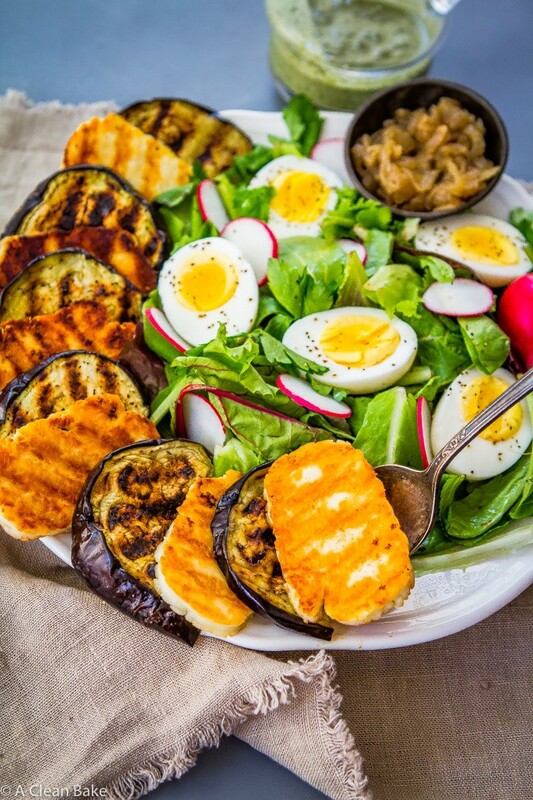 The story behind it may not be the most riveting, but the eggplant salad itself is a glorious plate of flavors, textures, and colors – as all salads should be. The rest of the salad is simple: I had caramelized onions, and a big bunch of radishes in my fridge. On they went! And when it came time for the dressing, I decided to go a different route than usual and, in keeping with the vaguely-mediterranean theme of the salad (I guess? ), made a batch of pesto with the radish greens, thinned it out, and called it dressing. I also added hard boiled eggs for some extra fat and protein to make this as filling as possible without adding meat. Once in awhile, we remember to do Meatless Monday around here, and this happened to be one of the rare weeks we were successful! So if you do a meatless meal once a week, this is a great option. Even if you aren’t in it for the meatlessness, this is a great option! 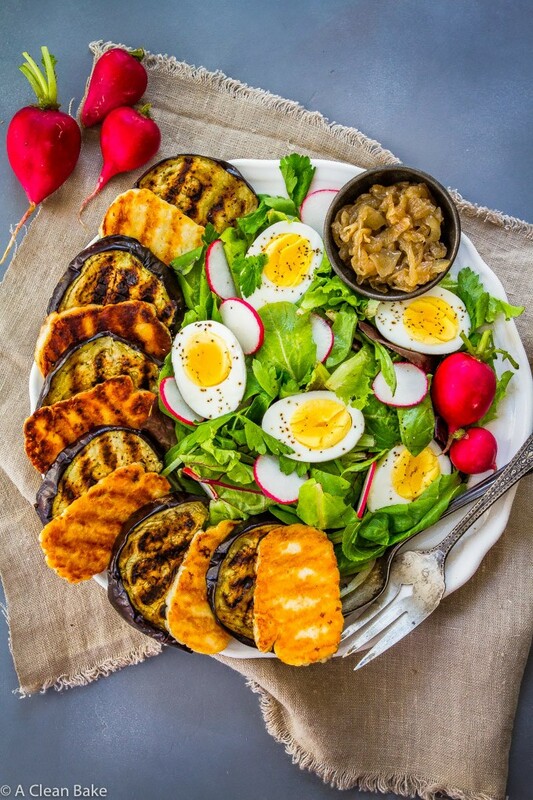 The grilled eggplant and halloumi can be served hot or cold, and since it’s a salad, cold probably makes the most sense, making this an excellent make ahead/meal planning option to boot! If eggplant salad isn't a go-to dish in your house, it's time to change that! 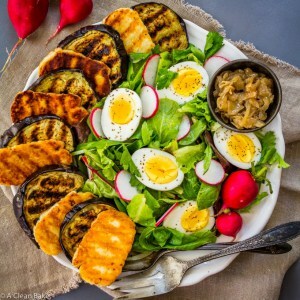 Throw some sliced eggplant and halloumi cheese on the grill, or in a pan, and add it to a bed of fresh greens, crisp radishes and hearty hard boiled eggs for a meatless entree you'll love. Slice the eggplant. Liberally cover it with table salt and set aside for 15-30 minutes. Rinse the salt off of the eggplant, then pat it dry. Slice the halloumi and set aside. 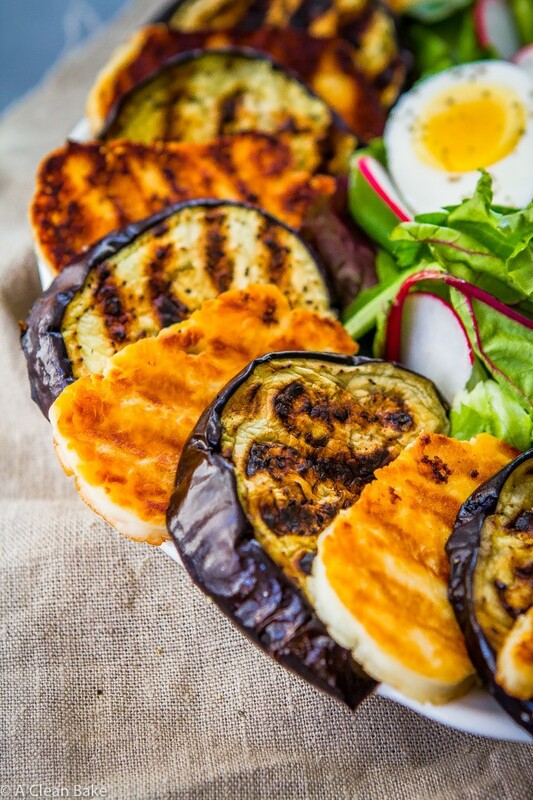 Place the eggplant and halloumi on the preheated grill or (lightly greased) grill pan and cook until grill marks start to appear. Flip and cook until grill marks appear and the cheese is firm. 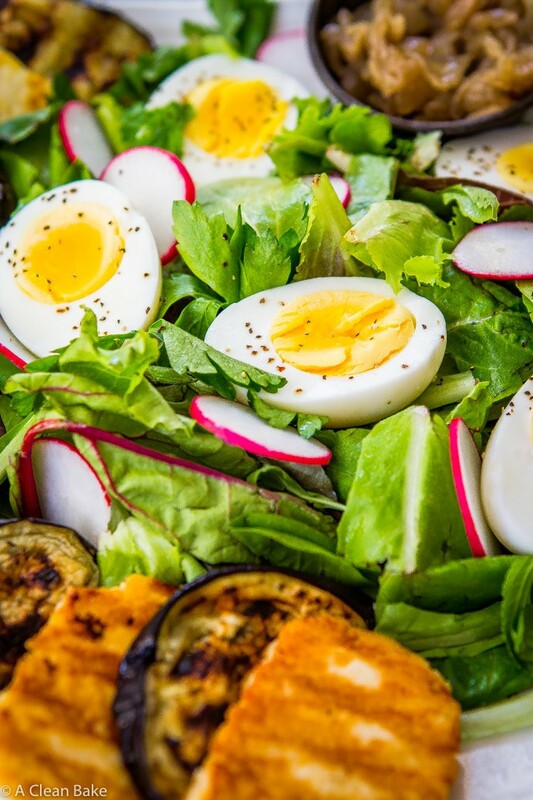 Assemble the salads by placing a bed of greens on each plate, and topping with the eggplant, cheese, radishes, onions, and eggs. Make the dressing by pureeing all of the ingredients in a blender or food processor until smooth. Drizzle with pesto dressing immediately before serving. As halloumi cooks, it releases a lot of water. It may smoke or sputter, but don't panic. Eventually, the moisture will cook off and grill marks will appear on the cheese. You'll know the halloumi is ready to flip when it's firm enough to do so successfully. That sounds like an oxymoron, but if you try to flip it and it is floppy or starts to crumble, it's not ready yet. You can serve this with the eggplant and cheese hot or cold. You can use any pesto you want, but I used this radish greens pesto recipe. If you use a different pesto recipe, depending on how runny it is to begin with, you may need more or less oil or water to thin it out. This saaalaaaaad! Girl, I’m nearly speechless. First off, it’s been far too long since I’ve enjoyed me a good halloumi, and secondly, grilling is my favorite cooking method when it comes to eggplant. Thirdly, caramelized onions whaaaaa?! I love. and lastly, pesto dressing? You’ve stolen my heart. This salad is pure perfection, over and out.